So, instead of posting individual entries of vocabulary/phrases, I’m going to do a list of 10 every week. Most of the vocabulary and phrases here are from my own personal reading. Hopefully, these will help you expand your own vocabulary and you’ll get to learn more expressions! 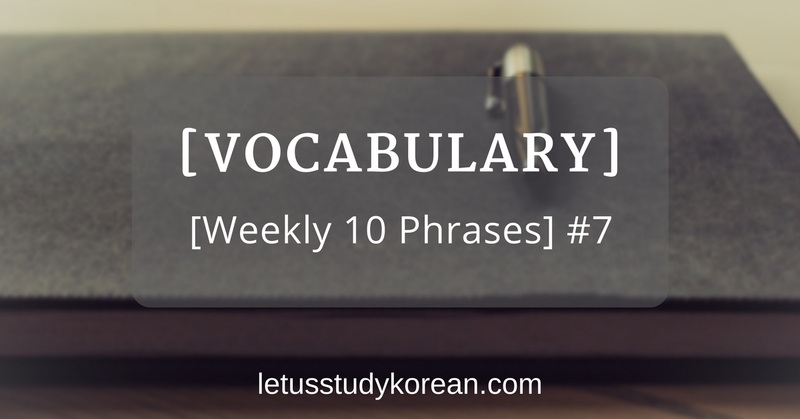 These weekly “10 Phrases” posts will be nestled under the Vocabulary section, so be sure to stay tuned! This week’s phrases are taken from a Naver webtoon 언터처블 EP93. A: 이 건 어떻게 해? 너무 힘들어. B: 걱정하지마 내가 알아서 해. A: How do we do this? It’s really tough. B: Don’t worry, I’ll take care of it. A: 너무 늦어서 미안해. 이따 점심 사 줄게. B: 신경 쓰지마. 나도 금방 도착하니까. A: Sorry for being so late. I’ll buy you lunch later. B: Never mind. I arrived just now too. A: 어휴… 오늘 일이 많아서 진짜 피곤해. 집 돌아가고 싶어. B: 에이. 1시간도 안 남아. 조금만 참아야지, 응? A: *Sigh*… There’s so much work today and I’m really tired. I wanna go home. B: Eh. We’re left with less than an hour. (We) just need to bear with it a little longer, hmm? 4. 좀 도와줄래? (informal) – Do you mind giving me some help? A: 안녕! 지금 뭐 해? 너무 바빠 보이네. B: 다음 주에 이사할 건데. 좀 도와줄래? A: Hey! What are you doing now? You look really busy. B: I’m going to move house next week. Do you mind giving me some help? A: 여기서 음식이 맛있고 바이올린도 들릴 수 있어. 어때? B: 잘 선택했어. 그래도 오랜만에 같이 있으니까 좋네. A: The food is delicious here and you can even listen to violin playing. How is it? B: You chose well. Even then, it’s great to be together after such a long time. A: 왜 그래? 피곤해 죽겠어 보이네. 어제 못 자? A: What’s wrong? You look so tired you’re gonna die. Couldn’t you sleep last night? B: My company’s event just ended. I couldn’t even sleep, I’m catching my breath now. 7. 갑자기 무슨 헛소리야? (informal) – What nonsense are you spouting out of a sudden? A: 아까 경찰서의 전화가 왔네. 삼촌이 살인했다고. B: 갑자기 무슨 헛소리야? 지금 그만 해! A: A call from the police station came just now. They said that uncle murdered someone. B: What nonsense are you spouting out of a sudden? Stop it right now! A: 그 여자의 남편은 정말 나쁜 놈이야. 와이프가 아이를 혼자 챙기고 시장에 가? B: 에이. 남편은 아마 일을 해야지, 뭐. 그렇게 뭐라고 할 건 아니잖아. A: That lady’s husband is really a bad guy. Is his wife taking care of the baby alone and going to the market? B: Eh. Her husband might have to work. You can’t say it in that way, you know. B: 그 여자가 우리 사장님의 안내야, 안내. 꿈도 꾸지 말아, 알았어? B: That lady is our boss’s wife, his wife. Don’t even dream of that, got it? A: 날씨가 너무 더워. 아이스 아메리카노를 마시자. B: 그래! 속이 다 시원하네. A: The weather is so hot. Let’s drink iced americano. B: Alright! This is so refreshing.